This building is in the centre of the photo, with the white walls and black wood. Built in 1507, it takes its name from the Flemish and Hugenot Weavers who fled from France to escape religous persecution in the 16th and 17th Centuries. The house stands on the River Stour which is somewhat not in view at the end of the building. 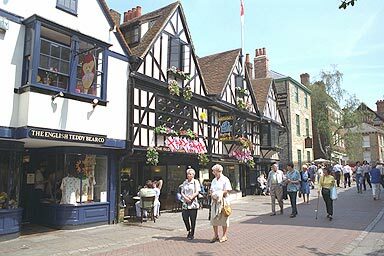 The Flemish refugees were welcomed by Elizabeth I who gave them the right to trade in Canterbury. She also offered them a special place of worship in the Cathedral, and a Hugenot chapel is still there today. This row of buildings houses several restaurants. Just down the street from the Weavers is the brown brick building that houses the Ask Pizza and Pasta restaurant. Photograph June 1997. © Copyright Peter Collinson, All rights reserved.